Pinky was a stray cat who kept hanging around my apartment in Clinton Hill in 2003. She was very whiny and was always trying to sneak into the house (including ripping a hole in the screen to get in). At the time I had 2 cats (Hubcap and Decatur) and my roommate had one cat (Mr Bones). I even had a cat who lived in our backyard I took care of (Freddie), I could not possibly conceive of taking care of another cat. 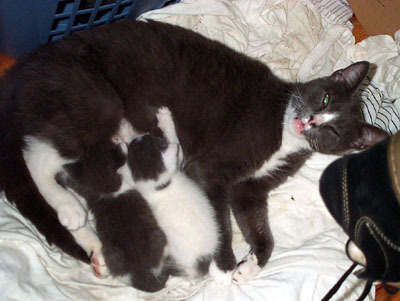 It was so impossible to imagine there was any room in the house, or that my schedule allowed the extra effort (I worked from home at the time) that I ignored the obvious signs that Pinky was about to have some kittens. A little later that summer, Pinky showed up at my 2nd floor window, with a tiny gray ball in her mouth. This turned out to be a kitten, she had carried it up a chain link fence to reach the 2nd floor. She stayed for a while and then went back out the window and returned with a white kitten. So now instead of one extra cat I had 3. Nice work, dumbass. 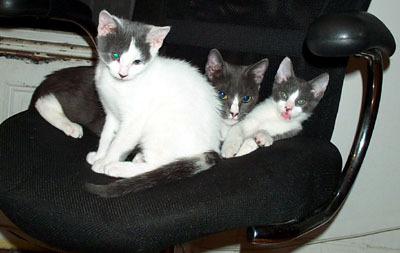 The kittens were probably a month old and the white one had a really bad eye infection. I can't remember the exact timing of it all, but soon after they arrived I made an appointment to take them to the nearby vet to get the eye looked at. The vet prescribed some ointment but wasn't optimistic about saving the eye. Right about then the lights went out in the exam room, which had no windows. After several minutes of confusion, we made it out to the lobby. The lights didn't come back on, so eventually they said I could just take the ointment and kittens and go. This may have been the first and last time I ever got out of the vet's office without having to pay for anything. The blackout continued for another day or so, it was a fun break from society for a while (though when I look back now, my life seemed so damned easy I can't imagine what I needed a break from). The kitten's eye started to get better, and both grew quickly. 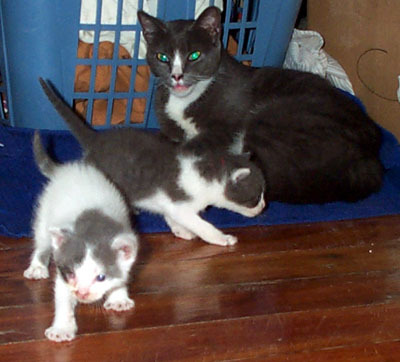 I didn't really notice it at the time but the gray kitten turned out to have cerebellar hypoplasia, a developmental condition possibly caused by malnutrition in the mother during pregnancy. Now that I know much more about it I would rate his condition as mild, and as a kitten I barely noticed anything off about him other than the fact that he fell down a lot. The white kitten's eye mostly healed although it's hard to say if his vision was impaired (he looks a little cross-eyed now). Within a couple months, the two boys had found their permanent home with a friend, where they reside to this day (as Maurice & Leroy). 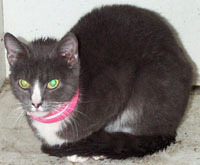 Pinky was also adopted and now lives in Colorado! Since that experience I dove headfirst into the cat fostering game when we moved to Bushwick a couple years later. 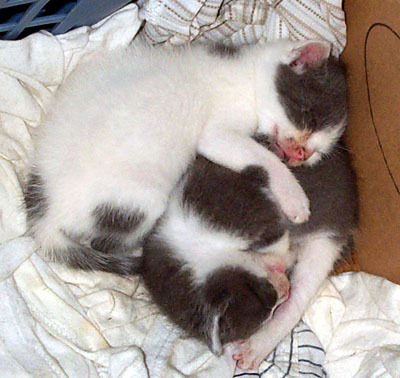 But it all began with these two scroungy kittens and their annoying mom. 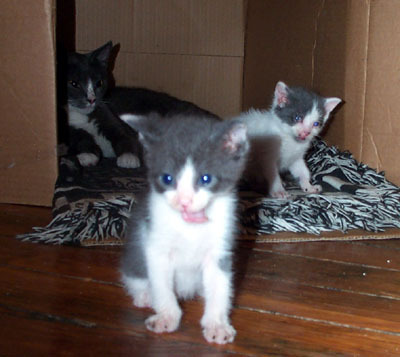 You can read the original posts about Pinky's kittens here (forgive the formatting issues, it's the raw html of my old site). This entry was written by Jimmy Legs, posted on August 14, 2013 at 9:57 am, filed under Cats and tagged blackout, CH, fostering, kittens, Pinky. Bookmark the permalink. Follow any comments here with the RSS feed for this post. Both comments and trackbacks are currently closed.